The bill that would make over the counter cold medicine that could be used to make meth prescription-only is making its way through the General Assembly, and while law enforcement officials generally favor the legislation, it’s being met with stiff opposition from drug manufacturers (the ones who make the legal drugs. Meth manufactureres likely oppose the bill as well, they probably don’t hire lobbyists). What I don’t often hear from officials on either side of the debate is some response or echoing of the most common complaint I hear from the public…prescriptions require visits to the doctor. That’s inconvenient, but for many people, it’s impossible. For the uninsured and under insured, a visit to the doctor can break the bank. The debate on how to fight meth is getting more interesting as more and more states consider prescription-only laws. The question of how to fight a scourge without punishing the innocent is raised constantly, and it’s fascinating to see how various lawmakers answer it. If you’re looking for information on the healthcare overhaul law, this website from Hall, Render, Killian, Heath & Lyman is as close to raw information as you may get without having to wade through significant legalese, opinion and jargon. Perhaps most helpful is the timeline of when various reforms take effect. Republican U.S. Senate nominee Rand Paul belongs to a conservative doctors’ group that, among other things, has expressed doubts about the connection between HIV and AIDS and suggested that President Barack Obama may have been elected because he was able to hypnotize voters. The Association of American Physicians and Surgeons, based in Tucson, Ariz., advocates conservative and free-market solutions on health care and a variety of other political issues. But it also uses its medical journal and Website as forums for unorthodox medical views. Paul’s Democratic opponent Jack Conway has released a video that includes clips of Paul touting his membership in AAPS, then uses the group’s opinions to paint Paul as out of touch with Kentuckians. What Are Candidates Talking About? With the help of FiveThirtyEight’s news assistant, Micah Cohen, I studied the campaign Web sites of Republican and Democratic candidates for the House in the 33 Congressional districts currently labeled toss-ups by The New York Times political desk. Although a few candidates did not highlight particular issues on their official Web pages, and a few others remain engaged in primaries where there is no clear favorite, we were able to examine the sites for 29 Republicans and 29 Democrats who are likely to be on the ballot in November. 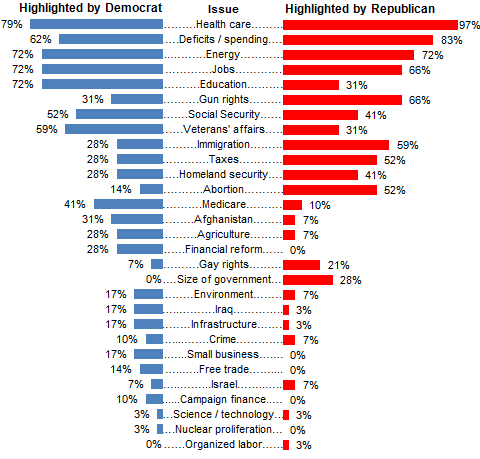 We then examined the subjects these candidates highlighted on the “issues” sections of their sites, dividing them into roughly 30 categories. Crossroads GPS is back with a second ad attacking Democratic Senate candidate Jack Conway. You can watch it here. The ad continues the previous theme of criticizing Conway for supporting the health care overhaul. In the spot, President Barack Obama is shown driving a car with Conway in the passenger seat as they head down a road marked with “wrong way” signs. A recent poll shows that support and opposition to the legislation is about even, with a slightly higher percentage of the public opposed to the law and support dropping (even though the bulk of the law hasn’t taken effect). However, seven states that are suing over the legislation are taking advantage of certain subsidies. Maybe that’s why the signs in the ad say “wrong way,” but the street Obama and Conway are heading down is drawn as a two-way road. There’s a federal database that tracks health professionals who have been disciplined. The point of the system is to let hospitals and others know about practitioners’ problems before hiring them. ProPublica reports that state agencies have not been reporting to the database, leading to data gaps and possibly incomplete information. All states are required by law to report the licensed health workers they’ve sanctioned to databases run by the U.S. Health Resources and Services Administration (HRSA). But ProPublica found that many state agencies either didn’t know about the requirement or simply weren’t complying. The failure to report means frontline health workers who have a record of on-the-job misconduct, incompetence or criminal acts aren’t flagged to hospitals or other potential employers, who pay a fee to run checks on job applicants. Wisconsin, for example, has not reported sanctions against emergency medical technicians. The state’s Department of Health Services website, however, shows that more than two dozen EMTs have been disciplined, including several for criminal convictions and one for stealing drugs from an ambulance. ProPublica has charted which states are not in compliance with specific fields of medicine, and among the worst states is Kentucky. Twenty-one states and Puerto Rico were thus chastised for not reporting on at least one category of health professional or ignoring the government’s requests for information. Kentucky was flagged for 10 professions; Louisiana, six; and Alabama and New Mexico, five each. The Rural Blog points out that many disciplined providers relocate to rural areas, where medical professionals are often scarce. The Democratic Senate primary is heating up with Jack Conway questioning Dan Mongiardo‘s stance on the health care overhaul. Conway supports the legislation, and he equates Mongiardo to Republican Senators and candidates for not speaking out enough in favor of reform. “As he applies for a promotion to the U.S. Senate, Lt. Governor Dan Mongiardo owes Kentuckians a simple explanation: Would he have voted ‘yes’ or ‘no’ on the Democrats’ health care bill?” asked National Republican Senatorial Committee (NRSC) spokeswoman Amber Marchand. A national GOP group is questioning a Democratic candidate in a primary…how will this resonate in Kentucky? WFPL’s Rick Howlett has the story on Congressman John Yarmuth‘s vote for the health care overhaul last night. Yarmuth was the only member of Kentucky’s delegation to vote for the legislation, and his statement is included in the story. UK student Brittany Hunsaker was featured on Morning Edition today. She wrote an essay about how the health care debate affects her, a rural Kentuckian. When it comes to health care, I do have options — just not good ones. In the rural county where I grew up, it’s not just youth who don’t have insurance. Adults, unemployed or underemployed in minimum wage jobs, are also without coverage. You can get health care there if you’re in a dire situation — say, if you’re pregnant or recovering from drug addiction. I know a few girls who got pregnant just to afford a doctor’s visit, or had another baby just to keep their health insurance. I am not financially or emotionally ready to bring a child into this world. But I feel like I am being penalized for getting an education while others are rewarded for their reproductive capabilities. You can read and listen to the whole essay here. What do you think of Hunsaker’s piece?